And the MAC lipstick addiction goes on! I think I'll be in love with MAC lipsticks forever. I can say 'Once you go MAC, you will never go back!' I had a chance to get hold of this shade from MAC when Rae posted on her Instagram account that she'll be letting go of some of her lipsticks. Knowing her, I didn't doubt about the lipstick's condition and never even bothered if the lipstick is pre-loved. She sanitized the lipstick properly and have used the product only a couple of times. This shade from MAC lipsticks is one of my lemmings. It's on my MAC lipstick shades wishlist. Out of 10 shades, I already have 3. So I guess the wishes are coming true one lipstick at a time :) According to MAC's website this shade is a Colour plus texture for the lips. Stands out on the runway. Simmers on the street! What made M·A·C famous. Click CONTINUE READING to see the swatches and if it suits my skin tone. According to MAC's website, this shade is described as Lavender Violet. I love the shade even though I have pigmented lips, the real color shows whenever I'm wearing it. Swipe twice on my pigmented lips under fluorescent light. Shows the same color, unlike other lippies that goes lighter or darker under different lighting. The packaging is simple and I love that it's color black. The packaging is sophisticated. Really pigmented, goes opaque on my lips. The texture is creamy and applies smoothly on my lips. The scent- sweet but not overpowering. There's a hint of shine on my lips even if this is from the amplified cream line which consists mostly matte finish lippies. Lasted 6 hours on my lips. There's a little fading after a few sips of my drinks but it's not obvious. Leaves a pretty purplish pin stain once faded. I think it will suit most skin tones. It's a pain to remove, even if I use my trusted eye and lip makeup remover. Pricey for a cheapskate like me and for girls who are beauty on the budget. Will I repurchase? Yes if there's a budget. I also want to try other shades like Russian Red, and Morange plus 5 other shades on my wish list. I give this shade a 4.75 rating. I've been sporting this shade because I find the shade chic and sophisticated. Not too loud nor too bright. At first, I thought it's way purple that I may not be able to pull it off but tada! 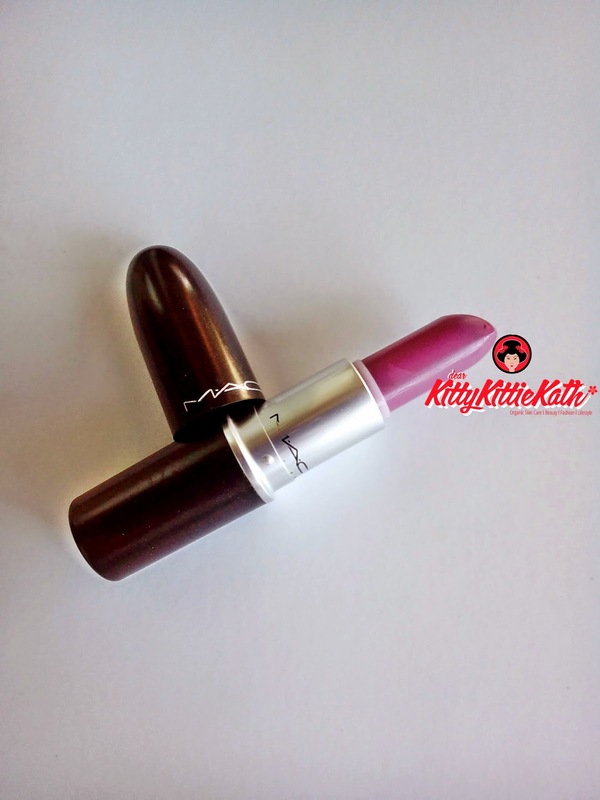 One of my favorite shades from MAC lipsticks now. FOTD on my next post, my bad I can't find the perfect lighting that's why I wasn't able to post it today. What's your favorite MAC lipstick shade? Thanks for sharing!